Narmadee packers & Movers - Service Provider of loading and unloading services, industrial packing services & car carrier services since 1983 in Bhopal, Madhya Pradesh. Our packaging experts load and unload the goods through the use of our large fleet of trailers, containers, lifters, hydraulic elevators and more. We work tirelessly to make sure that the goods are perfectly packed and do not get damaged during transportation. We use boxes and cartons according to the packaging of goods. We do packing in corrugated boxes, wooden boxes, craters and paper cartons to pack your valuable goods. We are engaged in offering a wide assortment of industrial packing services to our clients. We use superior range of packaging materials for packaging of valuable goods. Furthermore, with the help of our team, the wide array of industrial goods and machines is reaching safely at destination. Narmadee movers & Packers is known to offer reliable and efficient car carriers services in India. We are proud to have specially designed trailers and trucks to guarantee a safe-and-sound transportation of your cars. With our chain of network spread throughout the length and breadth of the country, we ensure speedy, swift and safe transit of cars and all other vehicles at the desired destination in national wide. While Packing we use specific packing material so that we can prevent your household items from damage and scratch. We take utmost care while packing your household items. While packing of your furniture we use moisture proof, termite proof, and dust proof wrapping material. We pack your clothes hanging in wardrobe cartoons. Different sizes of our own fabricated cartons are used to differentiate between the different types of goods and suitable to withstand weight and delicacy of the goods packed inside. We pack your valuable personal belongings as per the nature of the item & goods with the help of our trained & skilled staffs. While packing we take utmost care of your valuable belongings. The entire packing process is done under the careful supervision of our experts who make sure that all the goods are perfectly packed, so that they don’t get damaged when they are moved from one place to another. 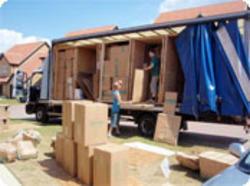 Delivery of goods by movers and packers as per customers needs. Allows easy access to process orders and distribute products quickly and cost effectively. 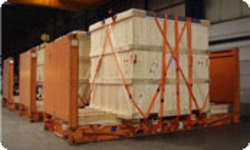 Experienced personnel for all the activities like loading, unloading, shipment etc. Complete round the clock security. Convenience in handling large inventories. Professional handling and so no tension of loss or damage.